The world of Feng shui has taken the world by storm. This ancient Chinese knowledge that literally means wind and water is being increasingly applied to various facets of home and office décor so as to create an environment that follows the simple and time-honored tenets of good housekeeping. Feng shui basics involve ancient Chinese mathematics and revolve around placement of objects in a manner so as to improve 'chi' or energy. This energy has palpable manifestations that have the potential to affect our well being. Learn more about the feng shui bagua and its implications on different areas of your life. Further your understanding of the world of feng shui so that you can appreciate the changes suggested by your feng shui consultant. 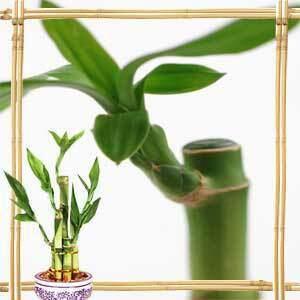 Feng shui basics find root in the Taoist vision that the land is alive and filled with energy. In ancient Chinese culture, gentle wind and smooth water had positive connotations whereas harsh winds and stagnant water were linked with negative elements. Good feng shui practitioners try to promote the flow of positive energy and prevent the leakage of nourishing energy and curb the development of negative energy. The basics of Feng shui aim at living in harmony with the elements of nature. Feng shui practice has two main branches: ti-li (landform) and chai-yun (building). The landform branch examines the flow of energy through mountains and rivers and valleys whereas the building branch concerns itself with the flow of energy within a structure. The world of feng shui explores the constantly changing energy and offers us a way to understand the environment we live in. Since energy can neither be created nor destroyed, it is essential to harness the universal life energy to our benefit. Indians refer to this energy as 'prana', the Catholics call it 'spiritus' and the Japanese call it 'ki'. Chi manifests itself in various forms, shape, color and sound. Aligning all the aspects that go into creating and maintaining positive chi can help us lead richer and happier lives and actualize our potentials to the fullest. The feng shui bagua was first used during the Chou dynasty by King Wen to describe the patterns of change in the world around. Soon after, the Chinese were using the bagua or pa-k'ua to promote the flow of energy in the palace and other locations so as to promote harmony and wealth. Feng shui history finds its technical base in I Ching's binary language. With the advent of Buddhism in China, the Buddhist practices also found place in this art of placement. Though Feng shui was introduced to the United States in the mid 1800s, it is only in the recent years that feng shui has found many believers and practitioners. 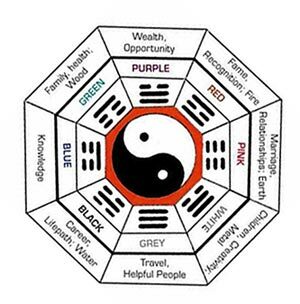 Feng shui bagua is a system of trigrams, which was designed by King Wen. This Bagua also functions as an eight-point compass that has each direction associating with a particular trigram. The nine elements of the bagua represent an aspect of our life. This functions as a template or map that allows you to encourage free and beneficial flow of chi throughout your home. 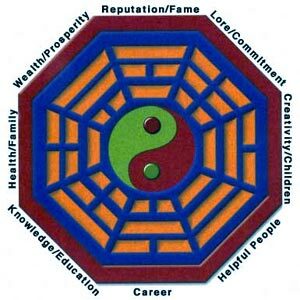 The feng shui bagua is an octagonal board divided into eight trigrams with a small round mirror in the center. Dividing your house into nine sections or guas allows you to clearly focus on different areas of your life. As was common with ancient civilizations, the Chinese too placed a lot of emphasis on the natural elements. The feng shui basics are guided by the five-element theory: water, wood, earth, fire and metal. These elements allow you to make adjustments to your space and heal any sort of imbalance. The cycle was based on these five elements: Water feeds plants that give rise to wood. This Wood creates Fire. The ash in the fire is the Earth. Metal comes from the Earth and this metal helps in collecting water. If you are planning to take the services of a Feng shui consultant, you must make a choice between traditional Chinese feng shui and a new age feng shui practitioner. Traditional Chinese feng shui has been around for hundreds of years and has stood the test of time. Familiarity with the Chinese culture is essential to become a good feng shui consultant. Formal training and apprenticeship is at the heart of a strong feng shui base for a consultant to apply his skills. 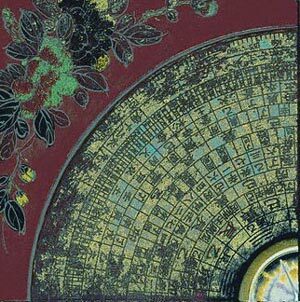 It is essential for you to understand the various recommendations of the feng shui consultant. Find out the 'why' rather than blindly accepting the principles. If you acquaint yourself with the different facets of feng shui, you can appreciate the moves made by the feng shui consultant and make appropriate choices. The feng shui chart is used by a feng shui consultant to tell you the elements and directions in your home or office that will need to be worked upon. This feng shui chart can tell you the colors best suited for you. A Feng shui consultant can help you bring out the best from each room of your house. The feng shui bagua chart can be applied to each house or even each room or plot of land. Anything with physical boundaries can be analyzed and placed within a feng shui chart. Feng shui has become an oft-used practice for the creation of a balanced environment to live and work and flourish. It is not about drastic and magical cures but about an energetic transformation that will improve the living space and thereby benefit those residing therein.